If you would prefer to see in 24-Hour format, this guide will show you how. As enabling 24 hour time within your account will affect all locations and employees, you will need System Administrator access to enable this option. This will ensure that all shifts are published and displayed in 24 hour format for all team members within the account. It will also display timesheets in 24 hour time. If you're a System Administrator for multiple organisations, please note that this will only affect the account you're currently logged in to, meaning you'll need to enable it for each account separately. First, click your profile in the top right corner, then click "Global Settings". 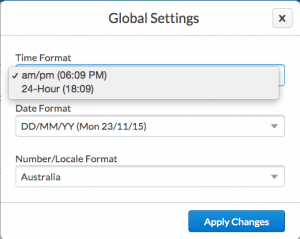 Please click the Time Format field at the top, then select the 24 Hour option displayed. After doing so, please click "Apply Changes". That's it!